Your Gathering at Memorial Park Might Require a Permit. Or It Might Not. 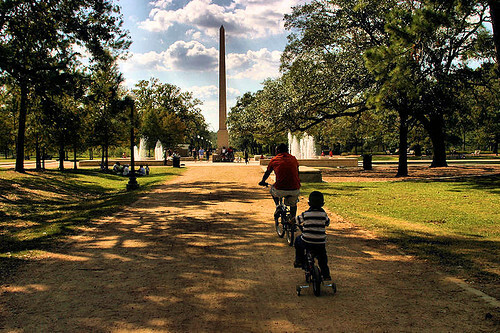 Hermann Park photo by Flickr user darkhairedgirl If you and a group of friends are planning on training for April's MS150 ride by barraging the picnic loop at Memorial Park, be prepared to show police an official permit to gather. While permits have always been required for large gatherings at the city's parks, an abundance of training groups, unofficial races and boot camps overwhelming Hermann and Memorial parks has led to a re-education campaign of sorts by the parks and recreation department and local police. Hair Balls first learned about the permit requirements this week when we received an e-mail from a group of cyclists who were approached by a police officer who asked to see their paperwork. They got off with a warning -- and Parks and Recreation assistant director Rick Dewees stressed the interaction was a friendly one -- but were told that tickets would be issued the next time they gathered without an official document. Dewees said that part of the problem is a lack of public knowledge of the permit requirements. "We probably could do a better job of informing people. Maybe we should have signs," he said. But when it comes to determining exactly what kind of gatherings require a permit, Dewees seemed a little unclear. "If it's a planned, organized event," he said. "I can't remember the exact wording, but if it's a gathering of organized activity. Ninety percent of the activity in Memorial Park is unorganized activity. Where it comes into play is if someone comes in with a large group to the point where they are interrupting the unorganized activity with their organized activity. "Sometimes permits are handy because they allow you a first claim on the space." He then directed us to the Houston Municipal Code's Chapter 32, which deals with the parks and recreation department. Except that code doesn't say anything about large, disruptive activities. A) No permit shall be required to use the parks or to hold any public meeting or gathering except in the following designated areas of the parks: (1) Any building or facility for which a rental fee is imposed by the city pursuant to section 32-69 of this Code; (2) Any baseball field, basketball court, tennis court, swimming pool, golf course, or other area specifically designated and equipped for sporting or recreational events, whether a rental fee is imposed pursuant to section 32-69 of this Code therefor or not; (3) The Houston Zoo; (4) The Houston Arboretum; (5) Any other improved and specially maintained area so designated by a rule or regulation promulgated pursuant to section 32-5 of this Code. Unfortunately, regulations referencing section 32-5 of the code are not available online, and Dewees didn't point us towards any. Still confused, we offered him a couple of hypotheticals: a family picnic? No problem. A gathering of five people? Okay, he said. Ten people is probably okay. After that, it gets conditional. Dewees suggested a group that large contact the permits office to get clarification. As for how much a permit costs, he couldn't give us an exact number, but did say noncommercial groups would have to pay a "nominal fee." Organizations like commercial bootcamps, running clubs and other businesses pay a larger fee, plus some percentage of their earnings. The ticket for failure to show permit can be as high as $500.